Memory is stored within the cache system in units know as cache lines. Cache lines are a power of 2 of contiguous bytes which are typically 32-256 in size. The most common cache line size is 64 bytes. False sharing is a term which applies when threads unwittingly impact the performance of each other while modifying independent variables sharing the same cache line. 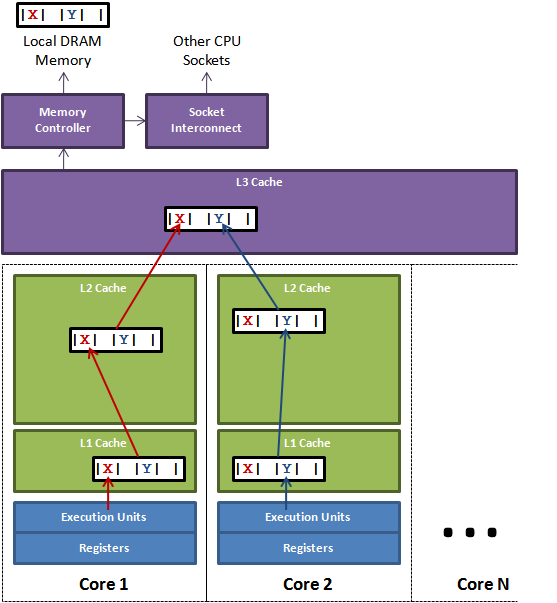 Write contention on cache lines is the single most limiting factor on achieving scalability for parallel threads of execution in an SMP system. I’ve heard false sharing described as the silent performance killer because it is far from obvious when looking at code. To achieve linear scalability with number of threads, we must ensure no two threads write to the same variable or cache line. Two threads writing to the same variable can be tracked down at a code level. To be able to know if independent variables share the same cache line we need to know the memory layout, or we can get a tool to tell us. Intel VTune is such a profiling tool. In this article I’ll explain how memory is laid out for Java objects and how we can pad out our cache lines to avoid false sharing. Figure 1. above illustrates the issue of false sharing. A thread running on core 1 wants to update variable X while a thread on core 2 wants to update variable Y. Unfortunately these two hot variables reside in the same cache line. Each thread will race for ownership of the cache line so they can update it. If core 1 gets ownership then the cache sub-system will need to invalidate the corresponding cache line for core 2. When Core 2 gets ownership and performs its update, then core 1 will be told to invalidate its copy of the cache line. This will ping pong back and forth via the L3 cache greatly impacting performance. The issue would be further exacerbated if competing cores are on different sockets and additionally have to cross the socket interconnect. With this knowledge we can pad a cache line between any fields with 7 longs. Within the Disruptor we pad cache lines around the RingBuffer cursor and BatchEventProcessor sequences. To show the performance impact let’s take a few threads each updating their own independent counters. These counters will be volatile longs so the world can see their progress. 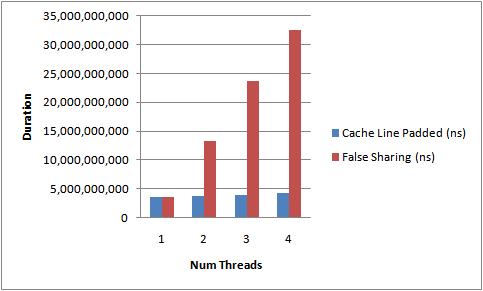 Running the above code while ramping the number of threads and adding/removing the cache line padding, I get the results depicted in Figure 2. below. This is measuring the duration of test runs on my 4-core Nehalem at home. The impact of false sharing can clearly be seen by the increased execution time required to complete the test. Without the cache line contention we achieve near linear scale up with threads. This is not a perfect test because we cannot be sure where the VolatileLongs will be laid out in memory. They are independent objects. However experience shows that objects allocated at the same time tend to be co-located. So there you have it. False sharing can be a silent performance killer.